Rolk Kaastel was the subject of an August 2014 City Weekly cover story. When Election Day came and went the first week of November, a blip of news on television screens in Arkansas had deep consequences for a man sitting in a prison cell in Gunnison. Outgoing Arkansas Gov. Mike Beebe announced Nov. 6 that he would grant pardons to 25 people, including a man convicted of stalking a child on the Internet and a woman convicted of negligent homicide. Beebe also denied 64 requests for clemency and declined to take action on 21 others. There was one piece of paper, though, that did not make it into Beebe's hands: a request from 63-year-old Rolf Kaestel, who has been imprisoned in Utah since 1999 for stealing $264 from a Bob's Taco Hut in Fort Smith, Ark., in 1981. Storing Kaestel away in the dusty southern edge of the Sanpete Valley costs Utah taxpayers $28,000 a year. Without adjusting to inflation, Utah has spent $420,000 warehousing Kaestel. 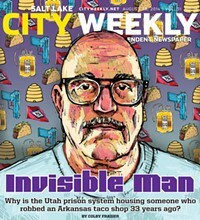 Kaestel's tale was documented in the August 2014 City Weekly cover story "Invisible Man," in which Kaestel's dwindling cast of supporters spoke in favor of his release. In 2013, Beebe did not take action on Kaestel's request for clemency—a move that, Kaestel says in letters, he hoped simply meant that the governor was waiting for his last days in the governor's mansion to make a decision. Kaestel's current request, a Beebe spokeswoman says, did not make it to the governor in time to be considered. The now-annual denial or non-action on Kaestel's request for clemency irks Kelly Duda, an Arkansan who met Kaestel in the 1990s while working on a documentary. "They just want him to die," Duda says. "Find me another water-gun robbery in Arkansas or Utah that resulted with a life without parole prison term. At a certain point, it just becomes absurd." The brush with the law that landed Kaestel behind bars came when he used a water pistol to hold up the taco shop. Then 29 years old, Kaestel had a long list of robberies under his belt. 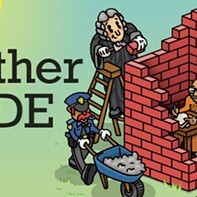 He'd served time in prison in several states, but had never been convicted of a violent crime. The employee Kaestel robbed has since pleaded for the man's release. A former assistant attorney general has advocated for his release, and a report by a parole board employee in Utah also urged Beebe to set Kaestel free. His plight in the Sebastian County Courthouse, where he was found guilty of aggravated robbery and sentenced to life without parole, was largely due to his decision to represent himself and how that choice may have rubbed the ambitious district attorney, Ron Fields, the wrong way. The steep punishment of life without parole for aggravated robbery isn't allowed in Utah. The circumstances that brought Kaestel to Utah are cloaked in secrecy. He entered the Arkansas prison system with the goal of drawing attention to his case through legal means. He became a paralegal and filed lawsuits against the Arkansas Department of Corrections. In one suit, while he was the editor of the prison's newspaper, The Long Line Writer, he was victorious, settling when the attorney general's office offered to buy him a computer and a printer. That spirit of agitation, though, eventually caught up with Kaestel. In 1999, shortly after participating in Duda's documentary film that drew attention to a prison blood-plasma program that had infected people across the world with HIV and hepatitis C, a pair of guards whisked Kaestel out of the breakfast line. A few days later, he wound up at the Utah State Prison in Draper. Kaestel's long residency in Utah is part of a program known as "interstate compact." According to Brooke Adams, a spokeswoman for the Utah prison system, Utah is hosting 34 inmates from other states in such arrangements, while 32 Utah inmates have been transferred to other states. Often, prison officials say, these transfers are executed because a prisoner asked to be closer to family, or for the prisoner's protection. But in Kaestel's case, his advocates in Arkansas say they didn't know where he'd been moved to for months. And, as far as Kaestel knows, he has no living family. A City Weekly reporter's visit during the summer was Kaestel's first in 15 years. Duda came across Kaestel by chance while making the film, and has been an advocate for his release ever since. He says he's optimistic that Arkansas governor-elect Asa Hutchinson, a Republican, will release Kaestel when the prisoner's request for clemency glides across his desk. "What is required is real leadership from the governor's office on this moral issue," Duda says. "Rolf Kaestel's not going away unless they let him out."